I am a very good cook. I can chop, butcher, saute, grill, you name it. But I’m not the most creative cook. In fact, I’m a bit of a thief when it comes to new ideas. I outright steal from chefs: talented and extremely gifted chefs. Here and abroad. My travels to Valencia, Spain brought me to restaurant Seu-Xerea (pronounced: essay-u-se-er-e-a). (After watching this video you’ll understand why I wanted to dine there.) On their tasting menu the chef produced chicken croquettes wrapped in fillo. It was love at first bite. I first tried to recreate their incredible chicken croquettes way back in 2011 when I returned from Spain. The first thing I had to find was the shredded fillo dough or Kataifi. An easy task if one sticks to ethnic markets or what I call my grocery store. Standard chicken croquettes are basically chicken thrown into a béchamel sauce, shaped, breaded then fried. 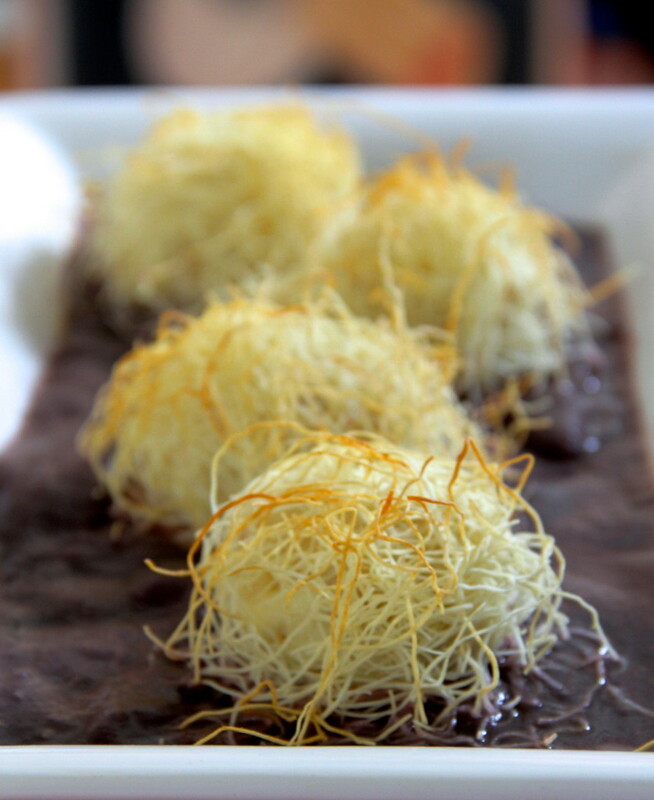 What I like about fillo wrapped croquettes is that the Kataifi provides the crunch without the fry. But let’s face it, chicken croquettes are a bit bland. So, I wanted to spice things up a bit. And what better way than to add chorizo, cumin, lemon and red pepper flakes to the bechamel? I infused the chicken with similar flavors when I boiled the thighs with onion, garlic, cinnamon, cumin and chorizo. The aroma wafting through my kitchen inspired me to reduce the cooking liquid and use it in the béchamel. By adding the broth I had found the missing layer of flavor I so craved. Many people ask if wrapping the croquettes in shredded fillo was hard. It’s not. You’ll start out a bit awkward and by the time you’ve wrapped them all you’ll be a pro. The video below shows you just how easy it is. If you’re pressed for time use leftover chicken and toss it with cumin, lemon zest and cayenne pepper to amp up the flavors in the béchamel. My favorite sauce to accompany these chorizo chicken croquettes is roasted red pepper sauce. I have also served them with a rather unusual purple Peruvian potato sauce. Heat butter in medium sauté pan over medium heat. Add chicken season with salt, pepper. Shape gulf ball sized balls out of the mixture. Take a small handful of the shredded fillo dough and encase the croquettes in it. This is not an exact science. Trust me you get better as you go along. Place wrapped croquettes non-stick baking sheet. Bake in a 375 oven for 15 minutes or until the fillo is crunchy. 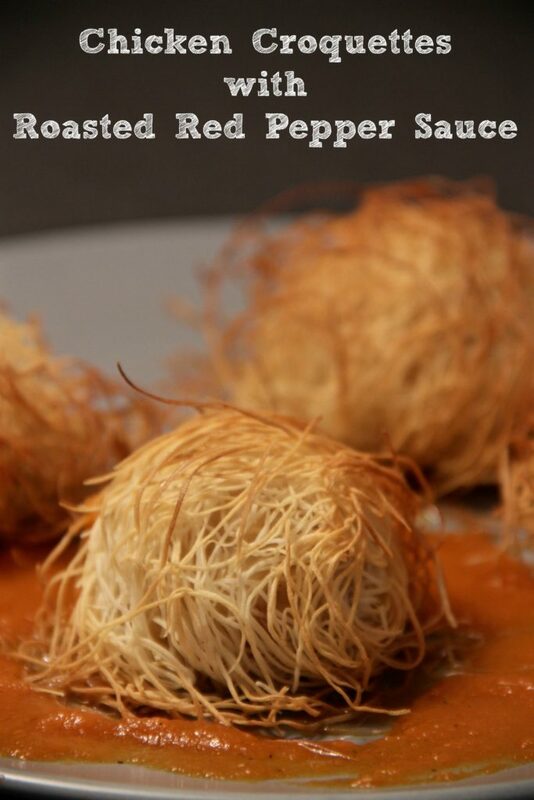 Serve with roasted red pepper puree. These can be made ahead and kept in the refrigerator for up to two days. I have made the croquettes, frozen them without the fillo. I then take out a few for a party and wrap them once they are defrosted. These are my favorite! 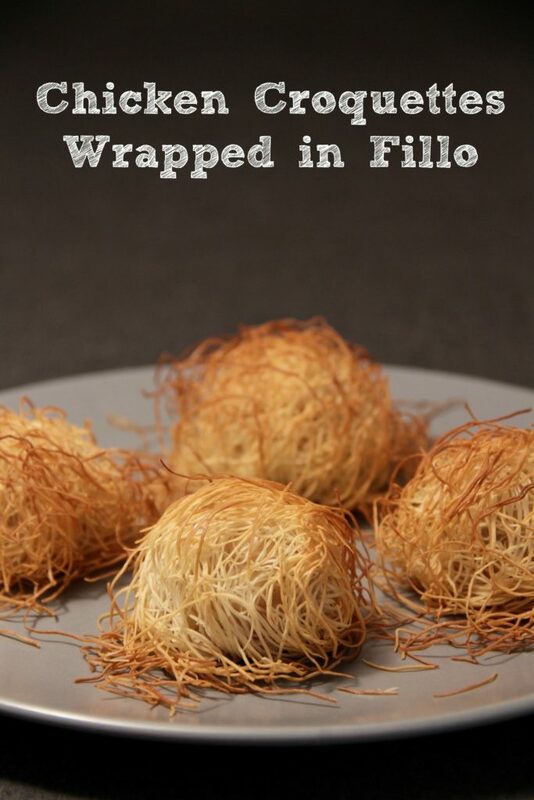 I love the crunchy filo with the smooth & spicy chicken filling. Thank you so much for posting the video as it really helps. I don’t care who you think you “borrowed” this from, I believe this recipe is creatively your own. You continue to amaze me with your creativity and skill. Thank you for sharing. I’m glad I got to taste these. Yummy! I only say Amazing! Can’t wait to try it.